Written by Will on August 18, 2012 and posted in Gaming Merchandise. UPDATE: The Pikachu 3DS XL has been available to buy for a while now in Europe and the US but stocks are running low. There’s still some left on Amazon but prices are starting to go through the roof. Buy your Limited Pikachu Yellow 3DS XL before stock runs out! Now’s your chance to pick up this limited edition 3DS but only in Wallmart, Gamestop,Target or Toys R Us. Interestingly March 24th is also the new Mystery Dungeon release date in North America so you could pick up both the game and a Pikachu 3DS XL on the same day. The first actual 3DS Pokemon games (Pokemon X and Y) are due to be released later this year so we’ll just have to make do with this until then. The first limited edition 3DS XL (the 3DS XL is known as 3DS LL in Japan) console will feature Pokemon’s lovably cute Pikachu! This super cute console companion leaps from the upper screen at you just crying out for a hug. Check out the Pikachu 3DS XL below. 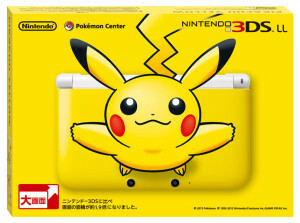 This is the front of the Pikachu 3DS XL showing Pikachu with his arms stretched for a hug. See more pictures and read more about it after the jump. This is the full graphic that is on the new Pikachu 3DS XL console being sold exclusively in Pokemon Centers in Japan. The outside of the Pikachu 3DS XL console is colored Pikachu Yellow with the inside being a rich cream-white. 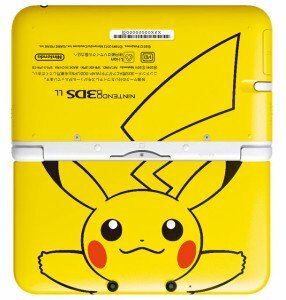 Pikachu spans both the top and bottom of the device with a pose featuring the cute little guy spreading his arms (I’m sure it’s for a hug XD) and his tail jumping the white trim shoulder buttons and ending up on the bottom of the 3DS. Strangely the have chosen to keep then entire shoulder area of the console white and it breaks the graphic, I have no idea why they didn’t just make it yellow and continue the graphic on it then on the bottom. This is the box that everyone who pre-orders the Pokemon 3DS XL will come in when people pick theirs up from a Pokémon Center in Japan. Sadly for you and me it’s only available from the Pokemon Centers in Japan (Tokyo, Yokohama, Nagoya, Osaka, Fukuoka, Tohoku or Sapporo to be exact) as a preorder between August 25th and September 14th, available to pick-up on the 15th of September. It’s priced at 18,900 Yen ($239), standard price for a 3DS XL. The Pikachu 3DS XL going to be very difficult to import but expect to see them going for a nice profit on places like ebay and other online auction sites. If your lucky enough to get one of these outside of Japan for the retail price then please let me know. No word yet on the amount available or an international release but I’ll update if any news surfaces. Since the 3DS was released last year there have been a few special edition models. 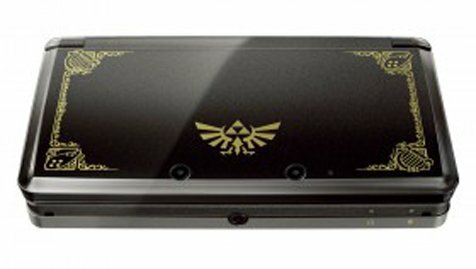 The Legend of Zelda – Ocarina of Time 3DS had a limited edition 3DS sold in a limited edition black & gold colour scheme from November 25th last year. 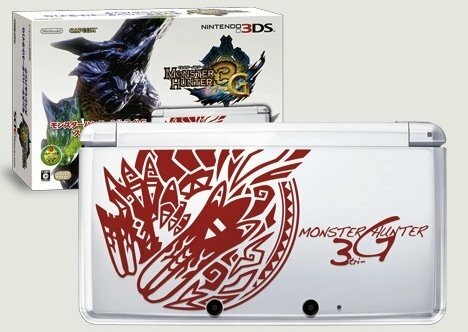 Capcom’s Monster Hunter 3G White 3DS was based upon the Ice White 3DS but sported a red Monster Hunter Graphic on the top screen. The latest limited edition 3DS was the blue Fire Emblem special 3DS sold alongside Fire Emblem Awakening in Japan back in April. Elegant and understated this Legend of Zelda Ocarina of Time 3DS version on the Nintendo 3DS looks sweet. It’s Black & gold and has a golden etching on the buttons inside and gold coloured sliders. 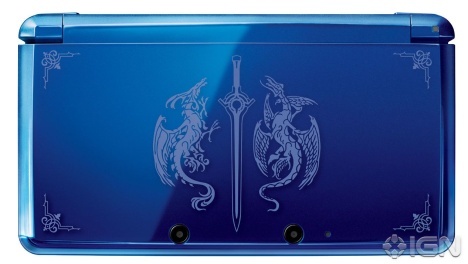 2 Dragons are etched side by side with a sword on this blue limited edition Fire Emblem 3DS console. This ice white 3DS inspired Monster Hunter 3G console came bundled with the game in Japan. 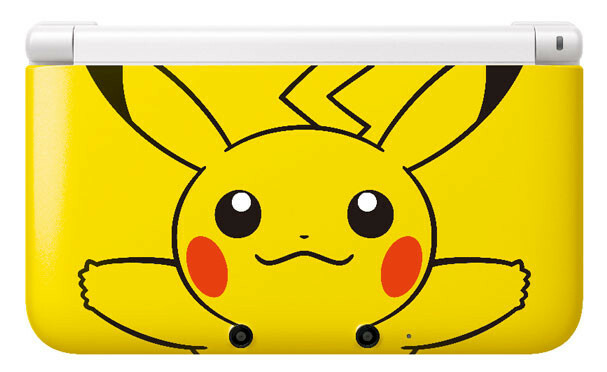 If you are like me, with an original Aqua Blue or Cosmos Black 3DS, and feel left out and wanna get something for your original 3DS to match the new Pikachu 3DS XL look here’s a pikachu skin for it that I found on Amazon. There has been no Pokemon 3DS game announced yet but Pokemon Black and White 2 are due out later this month for the original DS handheld, ya’know the one BEFORE we had amazing 3D screens and graphics on our handheld consoles. I don’t know why they have chosen to release another DS game instead of opting to release the new Pokemon 3DS game alongside the new cool Pokemon 3DS XL console.